Insurance is great for your body, but not for your mind. It happens multiple times every week. We get phone calls from potential patients asking if we take their insurance. The very simple answer to this question is “no,” and we do our very best to educate them about why in the short window of time that we have them on the phone. When willing to have a brief discussion about the pros and cons of using insurance for mental health treatment, those individuals tend to recognize the benefits of not using their insurance and proceed with scheduling an appointment. However, those who are only looking to use their insurance often decline and report they will call other clinicians to try to use their insurance. These same individuals often call back, though this usually occurs weeks later after they realize that most providers who take insurance are booked out for months. This can be very frustrating for individuals who have finally made the important decision to seek professional help as there is usually a notable amount of immediacy to get in for an appointment (our understanding of this has also led Tampa Therapy to make it a priority to keep several new client appointment slots in our weekly schedule). Before using your benefits, we encourage you to investigate all options and arrive at an informed decision regarding your health care. You can always decide to use your benefits, but you can’t reverse many of the negative consequences after using them. Considering the frequency that Tampa residents contact us about this, we want to share some insight on why you should not use your medical insurance for mental health treatment. The rule is that insurance companies only pay for services that are considered “medically necessary” (more on this below). This means that in order to utilize your medical insurance for mental health treatment, you must be diagnosed with a mental illness disorder. Additionally, the clinician must prove that your mental health condition is affecting your health and overall functioning on a daily basis. The problem is that many of life’s difficulties, and the reasons why people seek mental health treatment, are not mental illness disorders and are not diagnosable. When this is the case, your medical insurance is not going to cover the treatment. Insurance will not cover “I am having a hard time” or “I am grieving a loss.” Many of the patients that we see do not have a diagnosable disorder, so any intentions they had of ever using their medical insurance (in-network or not) to cover treatment becomes irrelevant. You may be thinking, “so just diagnose me,” but equally important is that any ethical therapist will not simply diagnose you for the sake of using your insurance for treatment. While you may initially disregard the importance of this, this is a very good thing. Couples therapy is an excellent example of where this often becomes an issue. Some insurance companies claim to provide coverage for couples therapy, however there is much more that goes into this. Insurance is billed using two pieces of information: the type and length of the session (e.g., individual therapy 30/45/60 minutes) and the mental illness diagnosis (the basis of medical necessity). The problem is that there is no procedural code explicitly for couples or marital therapy. In fact, the exact code is listed as “Family Psychotherapy with patient present.” This means the identified patient is the person whose insurance is being billed, has a diagnosed mental illness, and the understanding is that your partner is present as a support to you in treatment. There is a V-code, listed as “Counseling for Marital and Partner Problems,” however, this is a code that is typically rejected by insurance companies for not being medically necessary. The equivalent would be trying to get your medical insurance to cover a face-lift or botox for anti-aging. It’s just not going to happen. As far as insurance companies are concerned, couples therapy may be great, but just like a face lift, it is not medically necessary. So when an insurance company says they cover couples therapy, what they really mean is that, you, the identified patient who has a diagnosed mental illness disorder, is permitted to have your partner present in the room while you receive treatment for a diagnosed mental illness. And the therapy is supposed to be addressing the disorder. The problem again lies in that many couples seeking therapy do not meet criteria for a diagnosable mental illness. To further that, it is insignificant if your partner does in fact meet criteria for mental illness unless they use their own health insurance and are the identified patient. This is the term used by medical insurance to describe procedures or treatments they believe must occur, or if not, the person may suffer insurmountable consequences. A large goal of the insurance company is to contain costs, and one big way of doing this is by only providing coverage for services that fit into their matrix and which they deem “necessary.” Medical necessity is extremely important to insurance companies as they will only pay for services they agree must occur, and they will stop paying as soon as possible. As described above, the first component of medical necessity is having a diagnosable mental illness. Without a reimbursable diagnosis, insurance companies already view the therapy as unnecessary, and will not provide coverage. This rules out a large sector of insured patients who are looking to work on coping, managing stressors, relationship problems, grieving, or life coaching. Second, the illness must be causing significant functional impairment. Without these factors present, it is likely the insurance company will deny your claim. 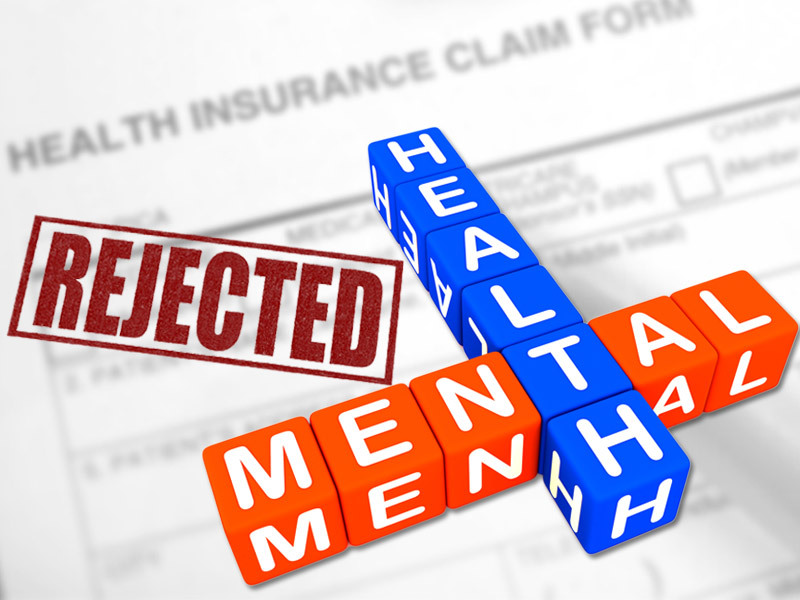 Any documented mental health treatment that is filed through your insurance will go on your permanent medical record. This can have a significant impact on your future ability to secure any health insurance coverage at all; if you are able to obtain insurance with this on your record, your insurance premium, deductible, and co-pays are likely to be much higher. Given the current state of affairs in the United States with regard to health insurance coverage, this concern is applicable to every person who possesses health insurance and is thinking of using their health insurance for mental health treatment. Is it worth it to you to potentially lose the ability to obtain quality and affordable health insurance, or any health insurance at all, because you want to file your therapy sessions through your insurance? One of the biggest concerns about using medical insurance for mental health treatment is the possibility of losing confidentiality. When your insurance is billed, not only do they require a diagnosis, but they gather information about the type of treatment you are receiving and whether you have improved or not (this is important to them because their goal is stop paying as quickly as possible). The insurer can also audit your records at any time they wish, which means they have full access to any details your therapist has, including information the therapist intentionally did not include in the claim submitted to the insurance company. Any and all information, including progress notes, which can include details about what occurred during the therapy session, is technically open to the claims specialist. Similarly, the average insurance claim passes through 14 people while it is being processed. These people are able to view information about your treatment including your diagnosis, treatment plans, progress notes, as well as any other information pertinent to them approving your claim. These details should be private, but are open to anyone with access when you use your health insurance. Confidentiality is also often lost when your information is being faxed to anyone in the health care industry who ever requires access to it, which often occurs while claims are being processed. While you may not care about this, if you a hold a high security clearance for a job, are seeking a military or federal job, a political position, an aviation position or any other job that requires health-care checks (many institutions are now screening out employees who may be unstable or cost too much money in mental health treatment and lost work days) or have other reasons you want your information to remain confidential, this is important to know. Additionally, children often have an even more difficult time when given a diagnosis, as their diagnosis follows them for much longer and can impact school, college, and be a barrier to pursuing certain careers. If your child’s condition warrants a diagnosis, you may want to have some say over how that diagnosis functions in their life – you may want to keep all treatment private. If you are a new patient using a in-network provider through your insurance, it is very likely you will have to wait a significant period of time before getting in for your first session. Patients, as well as my peers and other professionals in the mental health industry, have told me they were quoted anywhere from two to four months before being able to get in for a first appointment. This is truly unacceptable. If you have ever sought therapy before, or are currently seeking it now, you know what a big decision this can be. Typically, you have already tried to manage the problem in some way on your own – be it an external situation or an internal psychological issue. Perhaps you have read some self-help articles, sought advice from friends and family, tried to ride it out and allow “time to heal,” but finally realized you needed something more. To then hear that you must wait another two to four months before you can attend an intake session is both disappointing and potentially harmful. Though in some particular situations (such as relationship break-ups) it is true that time is one of the biggest components for healing, in many others (particularly with traumatic events) time only leads to more severe symptoms and internal psychological distress. As with anything else, the best results and less difficult path to healing comes when problems are caught and treated early. When a clinician accepts insurance, they by nature of their contract with the insurance company cannot specialize. The clinician can note the areas where they prefer to practice, and likewise advertise this to insured consumers, but they cannot turn away a potential client simply based on the person not being their ideal client so long as they have an opening and take that individual’s insurance. For example, I specialize in treating trauma, PTSD, grief, depression, anxiety, couples, and conducting psychological testing. If I were contracted with insurance companies to provide services, I would be able to advertise that I have a focus on these areas, but that is the extent of my being able to specialize. I would be required to see any and all patients who contacted me, so long as I accepted their insurance and had an opening. I could not turn down patients on the basis of them seeking treatment in an area outside my “specialities.” If that were the case, then by nature I would not be able to specialize as I would be required to see every type of person and problem who walked through my door. The problem with this is comparable to going to a family practitioner when you really need to see a neurologist. Sure, the family practitioner has medical training and can probably identify from a more general standpoint what may be going on, and they may be able to provide general treatments, but they do not have advanced training or experience in treating your precise problem. This is akin to seeing specialists for mental health treatment. This is also precisely the saying “jack of all trades, but master of none.” Just like you would seek a specialist to get the best care and outcomes for a physical medical concern, it is equally as important to seek a specialist for psychological concerns. So, you ask, what about scope of practice? This is an ethical concept!, and has nothing to do with the contract signed between the therapist and the insurance company. Insurance companies are not concerned with specialities or scope of practice, and that is because their stance is a licensed mental health professional is qualified to see mental health concerns (which, in fact, they are, but this does not mean the clinician is specialized in a particular area). To the insurance company, if a provider is a licensed mental health professional, they should be able to manage common mental health concerns just as a family medical practitioner should be able to manage common physical health concerns (but, as we know, sometimes you need more than managing; you need a specialist for advanced techniques and treatments and that is the key difference here). As such, insurance companies are focused on the legalities contained within the signed agreement between the clinician and the insurance company, which typically state they cannot turn a client away so long as there is an opening. No one forces a clinician to sign a contract with an insurance company, so when a clinician makes the decision to do so, they (legally) must comply with the requirements of the contract, which again, means they must take clients if there is an opening, which means they cannot truly specialize. This goes against what we tend to think of, as most medical providers are seen through your medical insurance. However, simply put, mental health treatment is very different. In the mental health field, most experienced and seasoned therapists simply do not take insurance. This is because they don’t have to (and don’t want to, but this blog is focused on the consumer side, so we will not go into specific reasons why providers don’t prefer to take insurance). Logically speaking, experienced and seasoned therapists are specialized and have enough of a following and community reputation that they do not need to acquire patients from insurance mills. New patients are referred to these experienced clinicians by other patients, other medical providers, attorneys, etc. This is not to say that all providers who take insurance are unexperienced, but this is often the case. When you see an in-network provider through your insurance, neither you nor the clinician get to decide how you spend your time in treatment. Insurance companies require that a treatment plan be submitted in order to approve the number of sessions and ultimately, they use this to determine how your time in therapy is spent. The number of sessions is determined ahead of time by the claims specialist (a non-mental health professional who you have never met and does not know your plight) and is not based on need. Attempting to extend the number of covered sessions often proves futile, as the insurance company has a matrix for determining what they believe are the number of sessions needed to correct the problem. The huge difficulty with this is that therapy is not at all predictable, so treatment may very well take longer. Further, their version of correcting the problem often means getting you out of crisis or back to a very minimal level of functioning. Truly effective and thorough therapy requires time, and insurance companies NEVER cover this type of treatment. Rather than giving you the care that best meets your needs (which in therapy sometimes means deviating from the treatment plan and discussing the terrible interaction you had with your boss yesterday), the therapist is responsible to the insurance company for “completing” your treatment within the pre-determined number of sessions. Bottom lime, an in-network therapist works for the insurance company, not for you. This is because of the contract with the insurance company that the therapist is required to uphold. Another common issue is that it can take months for your therapist to get reimbursement, if at all. These delays can interrupt treatment until your therapist is paid by the insurance company (or you) for services rendered. While many patients come to therapy who do not have a diagnosable mental illness, just as many come to therapy because they do have a diagnosable mental health condition (e.g., major depression, generalized anxiety, bipolar disorder, etc.). For these patients, it comes as no surprise that the therapist would notate their diagnosis in the record, primarily to know what they are treating and then provide effective treatments based on the presenting issues. There is a huge difference, however, between filing insurance claims with this information versus not using your insurance. Simply put, when you don’t use your insurance, this information remains private. When you use your insurance, your mental illness diagnosis, as well as your treatment, becomes part of your permanent medical record. You don’t get to take this information out once treatment is over, or ever. This can make applying for new health insurance, life insurance, or a new job incredibly difficult as they can require an authorization to release information to view your entire medical record. With the likely changes coming to healthcare as a result of the new administration likely overturning ACA, it is possible that people may once again be denied coverage based on a preexisting condition which includes mental health diagnoses. If you do secure coverage, companies can charge significantly higher premiums because of having ever been treated for a mental illness diagnosis. If you are someone who might ever be unemployed, self-employed, or need to purchase your own benefits, a mental health diagnosis can make the difference between preferred coverage or none at all. This is often one of the more significant reasons that resonates with patients, and why many who are insured often choose to not use their medical insurance for mental health treatment. Insurance companies will warn you, “A quote for benefits does not guarantee payment…” This means that despite being told verbally (over the phone) that something is covered and possibly even being given an authorization number, you can still be denied once they review the diagnosis. If you attend therapy sessions under the belief you are using health insurance to cover your visit, and the therapist receives a denial of the claim, you are still responsible for the full payment to your therapist. You can attempt to appeal the claim with your insurance company, but be prepared to go through several levels of appeals, which can take weeks to months – all while your treatment is likely interrupted. Additionally, you may have a deductible that needs to be met or a particularly high copay. For example, depending on your deductible, you may have to pay $500 or even $5,000 out-of-pocket before your insurance company will begin making payments on claims. In addition to the aforementioned reasons, which are focused on the client side, it is still important to recognize there are many, many well-intentioned therapists who would like to be able to provide in-network services to those who are insured (given that the client has taken the above factors into consideration). These same therapists often are unable to get paneled on insurance plans due to long waiting periods, multi-year waiting lists, and even after repeatedly going through the process of reapplying only to get declined due to full panels. Getting paneled with insurance companies is NOT as simple as “just applying.” Most of the time the process involves repeated denials, multi-year waiting periods, and incredibly low reimbursement rates. The decision comes down to practicing without taking insurance and being able to help some, or not practicing at all and not being able to help anyone; as you can understand, not taking insurance becomes the only option for many therapists. Unfortunately, medical insurance often becomes a hindrance to obtaining timely and effective mental health treatment. The biggest, and most sincere, suggestion I can offer is to simply pay out-of-pocket. You are putting the power back in your own hands in terms of finding the right therapist, choosing one who specializes in your particular problem area, and one who is likely very experienced. You are also in full control of the length of treatment and how often you attend therapy sessions. And, your record remains private. Another possible solution is to use pre-tax dollars, such as by using your Health Savings or Flexible Spending Accounts to pay for therapy. These accounts typically come in the form of a credit card with major credit logos. Also, unbeknownst to many, visits to your psychologist or psychiatrist can be tax deductible when paying out-of-pocket (however, this same rule does not apply to mental health counselor or social worker visits unless you are receiving psychoanalysis). This link to the IRS shows all available tax deductible medical expenses. I pursued this route. First I applied for a medical leave of absence for work when my mental condition became overwhelming and I realized it was going to start impacting my ability to perform. So I did the logical thing, requested time off. It took 2 months to be approved for a medical leave (denied FMLA and had to fight to get the medical leave because I had not been seeing an approved medical provider). This lead to my performance dropping and to some very serious physical conditions that almost required hospitalization. Now I am being required to go through a ‘claims management’ and ‘medical provider’ company because my employer does not deal with benefits directly (medical leave, even FMLA is a ‘benefit’ to them). Initially I was able to get in to see a therapist paying cash out of pocket. The office did not accept my insurance, and after calling dozens and dozens of offices was the ONLY office within an hour that could see me within weeks instead of months. I have a very high out of pocket deductible, so I figured cash was a good alternative even though this would not count towards my deductible. Fast forward and now work is requiring me to see a psychiatrist to substantiate my medical leave through their claims/insurance company. I was not even seeking a claim, I just needed time off which I thought was provided by my contract and benefits package… This required appointment was scheduled for a month out. I continued to see my therapist, cash out of pocket. FMLA is still pending, the outcome of evaluation will determine that but has so far been denied as an option. Again, I’m not looking for a handout, I just want to get the right treatment to get on with life and back to work! This episode has now resulted in over $20k of lost income and several thousand $ in medical bills dealing with this process. In the past, I was able to deal with my issues just fine by taking the time needed to self-heal on my own terms (seeing who I want, or time). Seeing a therapist that could see me now is not an option anymore. Both financially because I am off work with no income and if I want to be able to return to work. I can’t just pay out of pocket and keep it off my record, I am required to file through claims/insurance to validate my time off and have a paper trail of my illness. They are also demanding I sign a release for my therapist and IOP program to release ALL records, including confidential psychiatric notes which could cause me to be terminated. So far the claims/insurance company for work has caused more issues than have helped and have caused my condition to worsen. I also cannot seek employment while on “medical leave” or it is grounds for termination. Damned if you do damned if you don’t. So they have me between a rock and a hard-place with a gun to my head telling me to accept their treatment. This is a terrible way to treat an illness. I would pay cash, that is how I was brought up and all medical care was affordable. Everywhere I have been, no one can tell me how much it will cost, but I am responsible for payment. This is all so absurd. I keep rehashing the events and its surreal, nothing makes sense to me or my family. I have been advised by many to seek legal help now. I saw this recently watching my father go through cancer treatment, all the minimums and was forced back to work with major health complications, after months they have gotten worse as a direct result according to several doctors…. Oh, your leg is broken? Just un-break it. Easy peasy… ~Every insurance company ever. Thank you for sharing your experience. We are sorry to hear about this difficult insurance experience. Your story is yet another that validates how insurance can complicate matters more than help. Great column and an awesome resource. After reading everything I have the following question. If you receive a diagnosis, or the therapist notes if you don’t, does that become part of your permanent medical record if you use EAP benefits?